The March meeting of Lewisham Deptford’s General Committee passed the following motion about the Mayoralty. directly elected mayor. Yet the system was imposed. School and The Millwall fiasco. 1. To campaign for a labour victory in the forthcoming local elections. being run under the current model post 2018.
commitment to return to the traditional model for local government for future elections. Reporting on the Lewisham Deptford General Committee is still not happening so here is a report from me, about what happened yesterday. The Executive Committee had agreed to hear a guest speaker, Natasha Kennedy who came to speak about Trans-rights. If you’ve missed it, this is a debate centred on self-id occurring within the country as the Tory Government had proposed to change the law to permit a form of self-id, allowing trans-sexuals to choose their own gender identity as opposed to the current law which requires the agreement of a Doctor. The Tories, I believe, have changed their mind, but the Labour Party has agreed, as we do with membership of our BAME forums, to allow self-identifying trans-women to benefit from the positive discrimination measures that exist within the party. This is not without some controversy. Anyway, Natasha presented one side of the argument and shared her experiences. How can the Constituency Labour Party (CLP) better reflect the local community? What changes (if any) are needed to the way we work at Constituency level? How do we get our increased membership more involved in the Party? How do we get more people into the Party? He then asked people to call our their answers, with between a 15 sec and 30 sec comment? While not “in the traditions of the movement”, this worked very well. Many more people were able to speak and to comment on what they wanted. In retrospect, it worked well. Because of Ammar’s framing questions, we did not speak about the Socialist Societies, but I have documented on this blog, what I think and submitted my ideas to the Democracy Review. How can the Constituency Labour Party (CLP) better reflect the local community? Reduce the membership fees Listen to the membership & engage with community organisations. I managed to get the Nolan Principles into the CLP submission, and when someone else raised a criticism of the Stakhanovite doorstep warriors, they were politely cheered. The CLP also agreed to ask for much more money from the subs and to reduce the membership fees. We then turned to the motions, many of which are still left from last year. We passed emergency motions supporting the UCU strike, and calling on the London Region rule changes to be implemented for this year’s conference. The local Trades Council asked those seeking to be Labour’s Candidate for Mayor to answer a short set of questions; they present the replies in this document, “Judge for yourselves who will be the Mayor we need!”. They asked questions on Cuts, Education, the Living Wage (in the Town Hall and procurement portfolio), employment rights, housing, training and council/union relations. There are clear dividing lines, Paul Bell opposes cuts, opposes privatisation, promises to in-source services, opposes privatisation via academies, supports Union rights, will prohibit zero contracts, he will re-establish the town hall trade union negotiating structures and put the Chair of the Trade Union side on the Cabinet. He also plans to abolish the Mayoralty. His plans are based on concrete promises, not based on aspiration. If not a first choice for Trade Unionists, he must be a second choice. 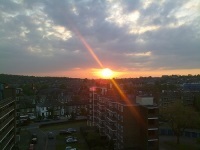 The Labour Party’s Lewisham Mayor selections ballots have been issued, by post and email. Ballot papers for eligible Labour Party members in Lewisham to vote for who our candidate for Mayor will be will reach you over the next few days. 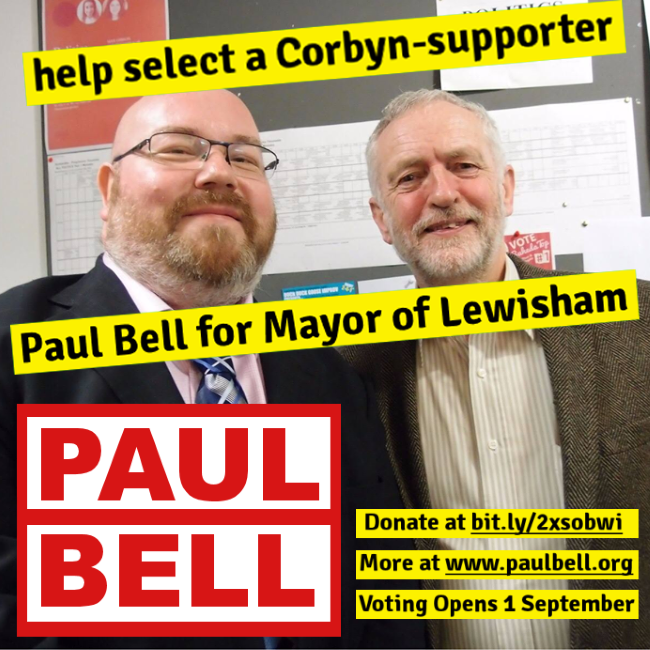 It’s crucial that to get out the strongest possible vote to help the Corbyn-supporting candidate, Paul Bell, win. Who has plans to rebuild the council’s relationship with workers and trade unions, stop academisation, stop privatisation and ‘insource’ services, build many hundreds of council homes and launch a fight against cuts and austerity. Unsurprisingly, all five candidates are talking left – but it’s necessary to look beyond warm words to politics and policies. As a matter of record, Labour members seem to only get to choose a mayoral candidate once every 20 years or so. A Mayor’s exclusive and entrenched powers of initiative and patronage are anti-democratic, weaken collective decision making and are sink for corruption. (In Lewisham we’ve been lucky). A Mayor cannot be recalled, a Leader of a Group can be. A Mayor’s powers of initiative and patronage juvenilises the majority backbench councillors, opposition councillors and ultimately even cabinet members. Labour Councillors are accountable to the Party every four years, Mayors are not, perhaps the Councillors should have more say. Labour Group’s internal processes are not good enough to hold a rogue executive mayor to account. The greater accountability of councillors to their Party and electorate, together with collective decision making should deliver better government. For instance, if the Lewisham Cabinet had asked the Labour Group about whether to issue the Millwall CPO, it wouldn’t have happened. Executive Mayors have always been established in the interests of incumbent leaderships. They are about party power, not citizenship empowerment. I’d add that support for the current system would come better from people other than candidates, cabinet members and councillors. 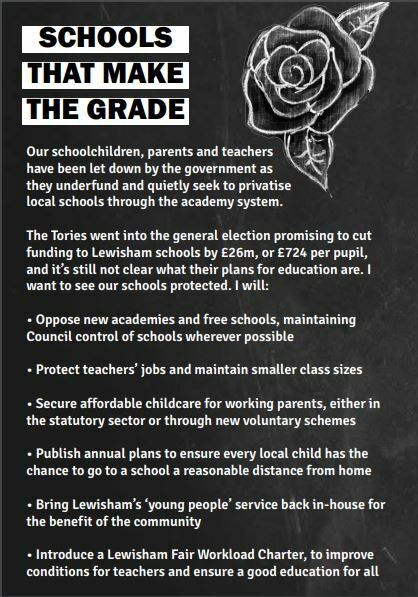 What should Lewisham Labour do next? Affiliation Memberships by Trade Unions are to be based on consent. Limiting expenditure including gifts in kind and 3rd party expenditure internal elections and selections (Good idea, the devil’s in the detail). #lab12 Despite being a member of the Labour Party for 38 years, I have never been to conference before; I have just returned from Manchester, where I attended for 2½ days. It was rather fun, jolly useful and thanks to some of the people I met, inspiring.